MNGI Endoscopy Center ASC, Inc.
All of these outpatient endoscopy centers have free parking for patients and visitors. Please note: Appointments are not scheduled directly by Community Anesthesia Professionals. ﻿Each physician group has its own scheduling team to assist you and answer your questions. The phone numbers and websites of those groups are provided on the﻿ Contact Us page of this website. Click here for a printable document with turn-by-turn directions to East Metro Endoscopy Center. Click here for a printable document with turn-by-turn driving directions to the MNGI Endoscopy Centers. Click here for a printable document with turn-by-turn driving directions to Minnesota Endoscopy Center. 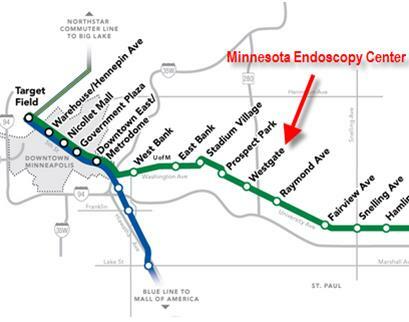 Minnesota Endoscopy Center is easily accessible by using Metro Transit’s Light Rail system and is within walking distance (across the street) from the Green Line’s Westgate station. **However, it is important to note that if you are having a procedure at our location, you cannot ride the light rail alone without a responsible party to accompany you home.